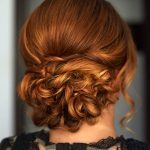 One of the most basic of hair updos, the two braided updo is one style that is a safe bet any day. It is a no-fuss look that can be sported for almost any occasion. This style also goes hand-in-hand with every wardrobe staple! Use a rat tail comb to create a central partition and divide the hair into two halves. And your two braided updo is ready! Classy and elegant, this stylized low bun is a treat to the eyes. Very stylish to say the least, this hairdo also makes your hair appear sleeker. You can style this updo in a contemporary fashion and steal the show wherever you go! This hairdo also wins extra brownie points for being hassle-free. 1. Using the rat tail comb, make a deep side partition. 2. Separate the crown part of the hair with the help of the rat tail comb. 3. Secure the crown part of the hair using a sectioning clip. This will ensure that it won’t interfere with the styling of the lower section. 4. Tease the lower section using the teasing comb to create a voluminous effect. 5. Create a low side bun near the nape of your neck using the lower section. 6. Release the crown section from the clip and tease its back for extra volume at the crown. 7. Now smoothen the surface of the crown and brush it back towards the bun. 8. Wrap the section around the bun. 9. Tuck in the edges of the upper section around the bun using U-pins. 10. Secure the flyaways with bobby pins. 11. Make the hairdo stay in place with a light-hold hairspray. Uber chic and casual, the messy bun is more often than not the urban girl’s go-to hairstyle. This hairstyle is a quick fix if you’re having a bad hair day. 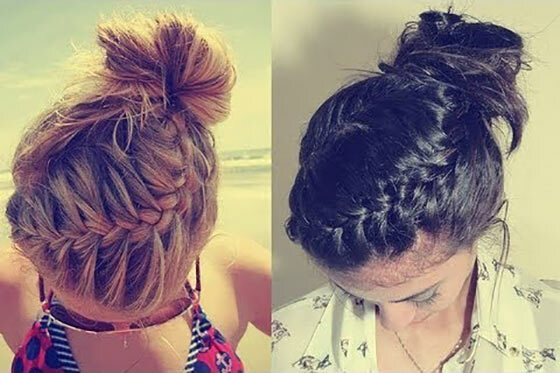 The messy bun hairdo also gives you a carefree air! Accessorize it with a headband for that extra edge. 1. Use the paddle brush to brush all your hair back. 2. Tease the top of the crown with the teasing brush for extra volume. 3. Gather all your hair at the back of your head and start twisting the length of your tresses. 4. Loop the hair through a hair elastic to create a half loop updo. 5. Spread the bun out and secure with U-pins. 6. Pull out a few face-framing strands for a casual look. 7. Accessorize the hairdo with a headband. 8. Finish with a light-hold hairspray to make the hairdo stay put. A dainty and elegant updo for your locks! This delicate style is perfect for accentuating your feminine features. You can sport this hairdo for occasions like parties, wedding receptions., etc. This will beautifully enhance your personal style and is sure to make heads turn! Go on, give it a try! On both the sides, take out two sections from the top of the crown. Secure the rest of your tresses into a ponytail by wrapping a strand from the nape of your neck around it. Now, starting coiling the ponytail around itself to create a bun. Once you’ve worked the length of the ponytail into a bun, secure it with U-pins. Start working these sections into side braids by incorporating the face-framing strands in the braid along with the two sections kept aside before. Once you reach the end of the sections, secure the braids with small hair elastics. Now wrap the braids over the low bun in an overlapping fashion. Finish styling by spritzing on a little light-hold hairspray. Trying to woo your date? 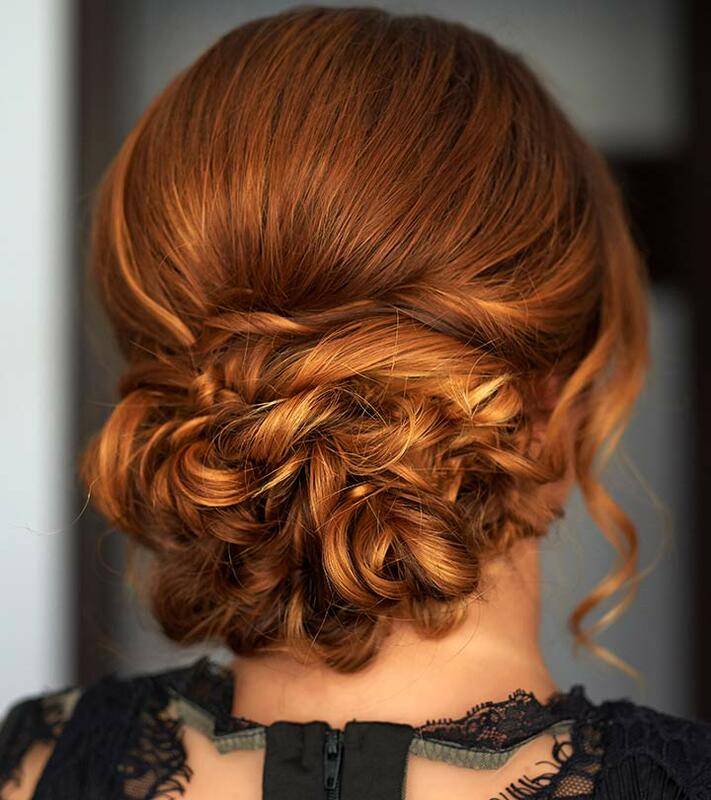 This updo is going to do the work for you! Very demure and attractive, the romantic curly hairdo is sure to make the onlookers swoon. Make a central partition using the tail end of the rat tail comb and divide your hair into two equal sections. Braid one section into a lace braid. This style is typically braided towards the side of the head instead of close to the scalp. Repeat the same on the other half. Secure the ends of the braids with hair elastics, lest the braids should come undone. Take one of the lace braids and lift it to secure it on the opposite side of the head using bobby pins. Do the same with the other lace braid. The two braids should overlap. Finish styling by spritzing some light-hold hairspray. A hep and fun way to style your hair. 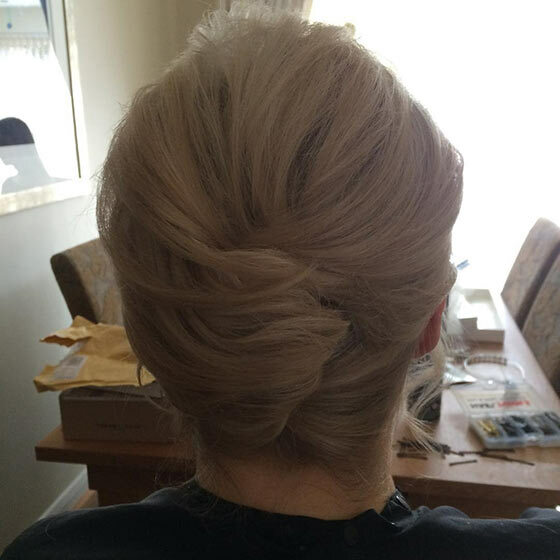 The stylized rope braid bun is for the experimentalist. This hairdo can be teamed up with any wardrobe staple and will bring your best artistic self out! Being easy to sport and hassle free to manage, this one’s surely gonna be one of your favorites very soon. Thoroughly comb your hair to ensure that there are no entanglements. Brush all your hair backward to start styling. From the crown, take two sections in order to create a rope braid. Twist the sections and work them into a rope braid. Braid till you reach the end of the sections. Hold one of the sections and with a comb, scrunch up the other section of the braid. Twist and wrap the first section around the scrunched up one to create a small bun at the back of your head. Just beneath the bun, take two more sections to create another rope braided bun. 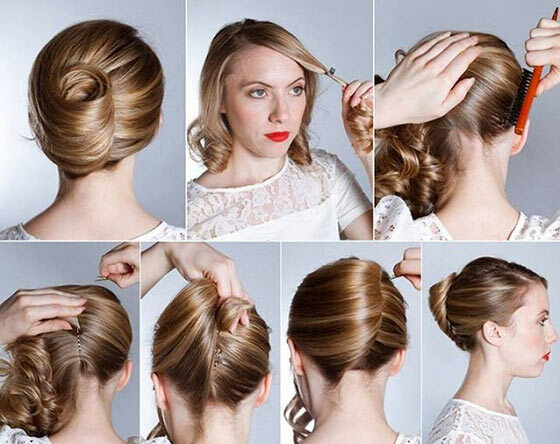 Keep repeating this step till you have incorporated all your hair into the updo. Once done, fan out the sections of the buns and neatly tuck the strays in using U-pins. Tuck in the flyaways with bobby pins, if need be. Spray on some light-hold hairspray to hold the bun in place. An updo with an edge. This hairdo is delicate and has a tinge of Bohemian flavor to it. It’s very easy to sport and manage. The side swept locks on the forehead add a touch of feminine grace to the whole look. This hairdo is sure to make heads turn! 1. Make a deep side partition using a rat tail comb. 2. Take sections of hair and mildly curl them using the round brush and blow dryer. 3. Tease the hair at the crown for extra volume. 4. Smoothen the surface of the crown and gather all your hair over to the larger side of the partition. 5. Take sections of hair and twist them upward to form small rosettes of buns. 6. Secure each rosette with U-pins. 7. Once all your hair is worked into the updo, secure flyaways with bobby pins. 8. Pull out a thin face-framing bang. 9. Finish styling by spritzing on some light-hold hairspray to make the hairdo stay put. A rustic style to sport. 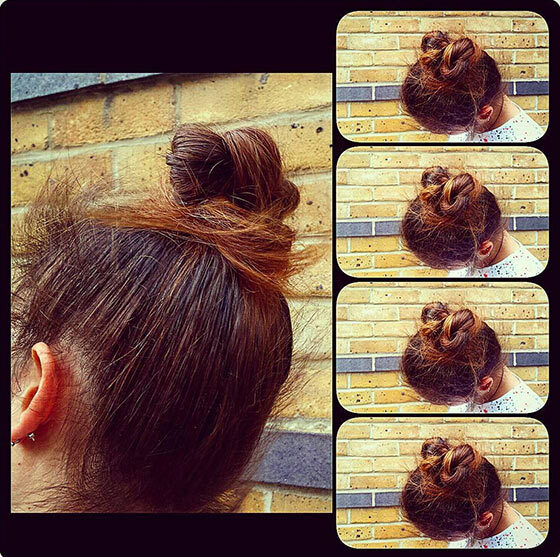 Unconventional, the chestnut bun will take your style quotient by up a notch. It’s a neat hairdo which can be easily carried and managed. Despite the voluminous appearance, it’s really light on your head! 1. Brush the length of your hair using the paddle brush. 2. Create an off-center partition at the front using the rat tail comb. 3. On the larger side, loosely side sweep a section of the hair and pin it just above the level of the ear using bobby pins. 4. On the smaller side, separate two thin sections of the hair and hold them up using the sectioning clips. 5. Gather your hair from the back of the crown and tease it to add volume to the hairdo. 6. 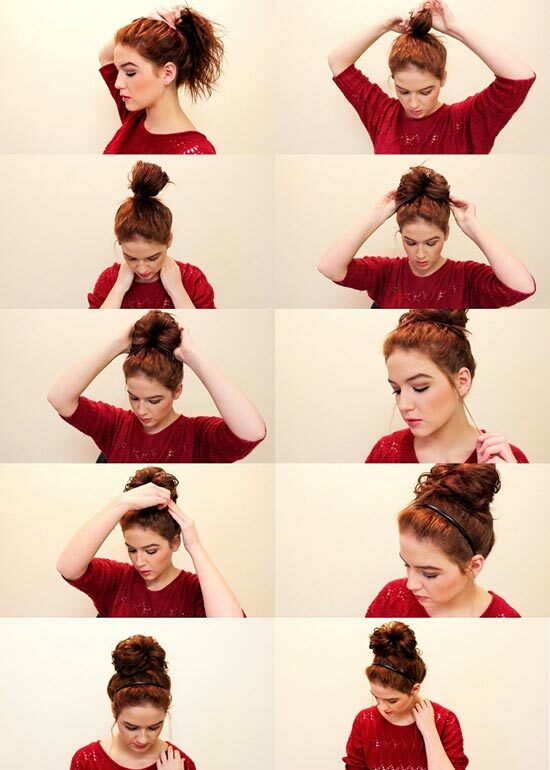 Twist your hair into a loosely held bun at the base of your head. 7. Secure the bun with U-pins. 8. Release the sections of hair held using the sectioning clip. 9. Twist the sections and wrap them around the bun. 10. Secure the ends of these sections using U-pins. 11. Finish with a light-hold hairspray. Chignons are always timelessly classy! They bring about an aura of calmness and sophistication. This is yet another graceful variant of the chignon. 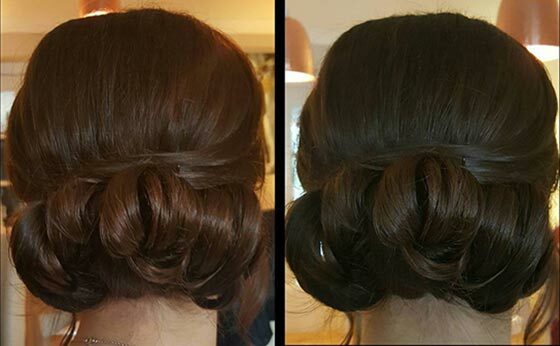 Simple, easy to create and easier to manage, the half-tie chignon is sure to get you ton loads of compliments! Take out two sections of your hair from each side of your head, just above the ears. Now, gather the rest of your hair and tie it into a ponytail using a hair elastic. 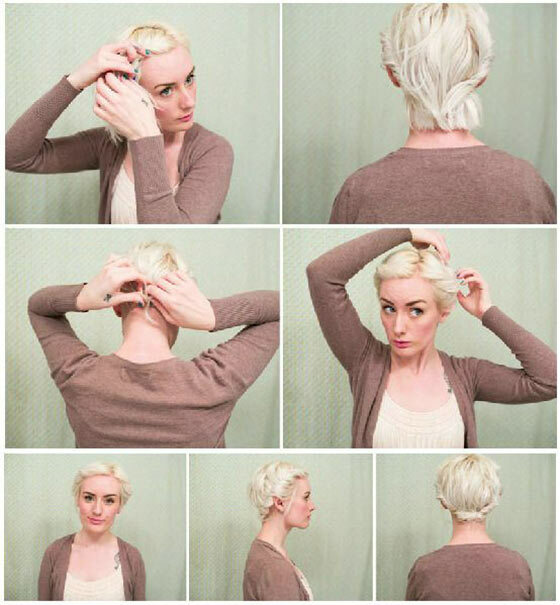 Wrap the ponytail around itself to create a low bun at the base of your head. Now start working the side sections into braids. Secure the ends of the braids using small hair elastics. Wrap the braids around the bun and secure them with U-pins. Tuck the flyaways in using bobby pins. Finish with a hairspray to make the hairdo stay. The French knot is a chic and sophisticated hairdo to sport. This is yet another delicate and dainty looking updo for the urbane woman in you. It’s easy to create and extremely beautiful. This is also a hassle-free updo and doesn’t require much effort to maintain. Curl the edges of your tresses using the hair curlers. Using the paddle brush, brush the hair on the smaller side of the partition towards the back of the head and secure it there using bobby pins. 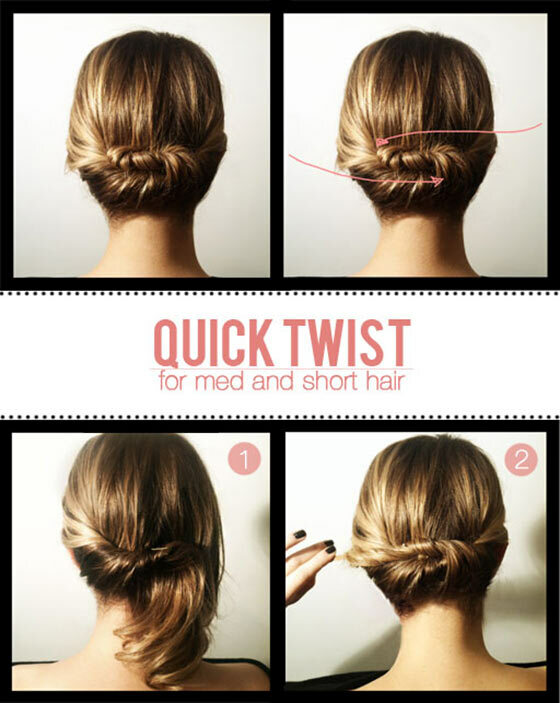 Roll the rest of your hair on the opposite direction to create the French twist. Secure the twist with U-pins. Finish styling with a light-hold hairspray. Yet another chic and high street hairdo! The crown twist is very urbane and stylish. You can team this updo with any closet staple. This is a no-fuss updo that will impart a sophisticated vibe to your persona. Take two sections of hair, one from each side of the partition, and twist them till you reach the end of the sections. Tie the ends of both the sections together using a small hair elastic. Wrap the rest of the hair around the hair tie by looping sections through the hair enclosed by the elastic. Keep pinning the sections using U-pins as you go. Once you’ve twisted and wrapped all the sections, tame the flyaways using bobby pins. Finish styling using a light-hold hairspray. 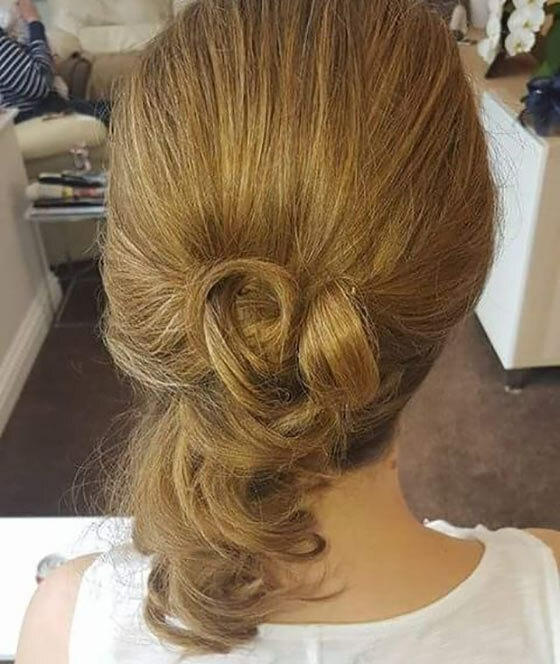 A perfect updo for a perfect date! This demure updo is sure to steal your man’s heart and make him sing praises for you! Easy to manage, you can always go for this updo if you’re having a bad hair day. Gather one half of your hair. 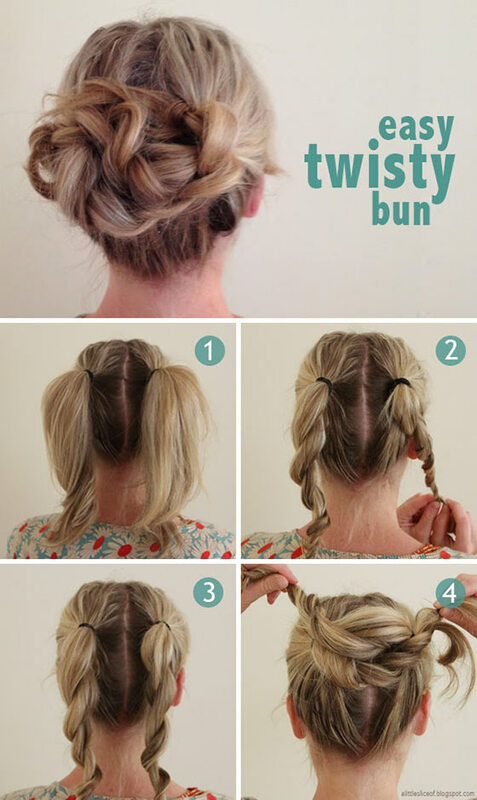 Twist it neatly and pin it up at the back of the other side of your head using bobby pins. Do the same with the remaining other half of your hair. The two sections should overlap each other in the fashion of a simple knot. Tuck away the stray strands using U-pins. Spritz the hairdo with a light-hold hairspray. If you want, you can accessorize the hairdo with an add on like a decorative comb or clip. A very casual and chic hairdo to sport during the summer. This stylish and urbane hairstyle is perfect for the power woman of the day. Hassle free, and thus winning extra brownie points, this hairdo is surely a traffic stopper! Divide your hair into three sections using sectioning clips. Braid your hair into a regular three section braid till you reach the edge of the hair. Fold the end of the braid inwards and secure it with a hair elastic. Roll the braid upwards and inwards to create a low bun. Secure the bun using U-pins. Tease the top of the crown using your fingers to give it a tousled look. Finish with a light-hold hairspray. Unconventionally cute and charming, this braided updo for medium hair is one to die for. This easy-peasy hairstyle is a no-fuss hairdo that is sure to take your style up a notch. Style this hairstyle using a decorative ribbon for maximum impact. Take a thin section from the crown and tease it to create volume. Leave the bangs at the front free to frame your face. Pin the teased section onto the scalp using bobby pins to create a small pouf. Start working the side sections of your hair into side braids. Secure the braids with small hair elastics. Gather the rest of your hair along with the braids and tie it all up into a ponytail using a hair elastic. Now loop your ponytail through the foam donut to create a base for the bun. 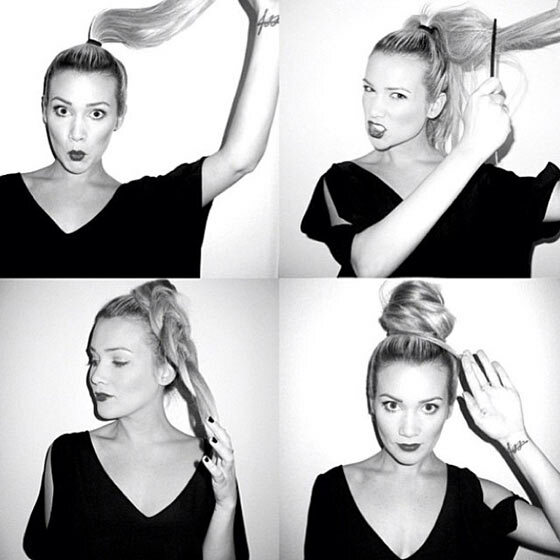 Create the bun by looping sections of the ponytail around the donut. Let the edges of the ponytail fall freely through the donut. Tie a decorative ribbon around the bun for extra oomph. Spritz on some light-hold hairspray to make the donut bun stay put. And voila! Your hairdo is ready to rock! Ballerinas swear by this style. And with good reason, of course! The sock bun is easy to carry and manage. And not just that, the hairdo formerly sported specifically during ballet recitals have now trickled into mainstream styling owing to its appeal. Go ahead, give it a shot! Gather your hair at the back of your head and fashion a tight ponytail. Now take the sock and attach it to the edge of the ponytail using a bobby pin. Start rolling the sock upwards, taking the ponytail with it. Once you have rolled the sock till the base of the ponytail, form it in the shape of a bun and pin it to the scalp using a few bobby pins. Rearrange the hair on the sock roll so as to conceal the sock. 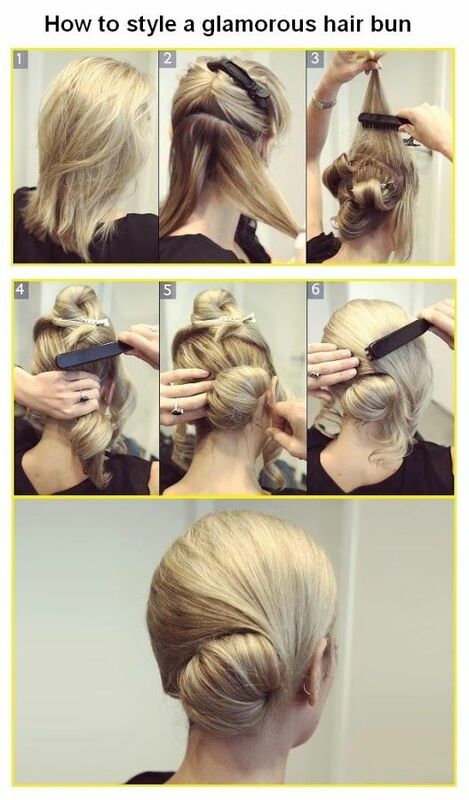 Secure the bun using U-pins and your sock bun is all set to go! 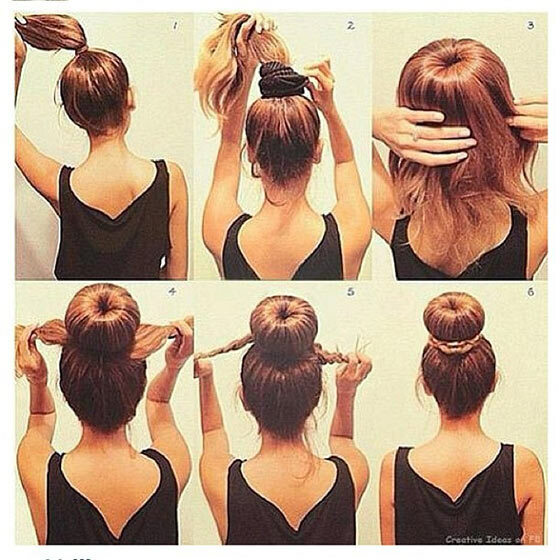 Yet another sock bun to rock your hair. Hassle-free, this could be your perfect daytime companion. You can wear the braided sock bun anywhere, be it work or a casual day out. This variant of the sock bun is sure to make heads turn. Gather your hair at the back of your head and tie it into a ponytail using a big hair elastic. Now take the sock and wrap it around the base of the ponytail. 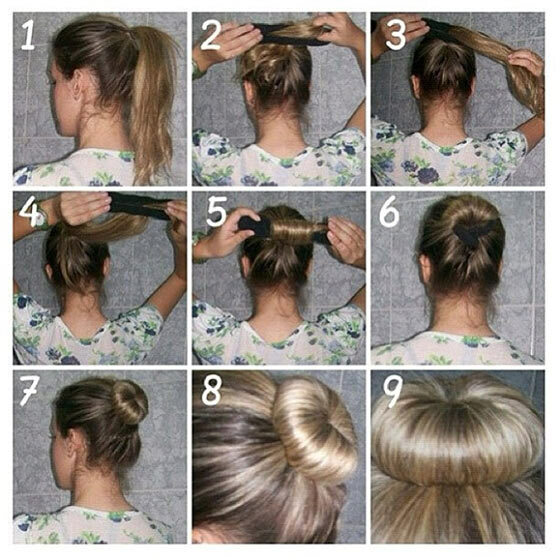 Loop the ponytail through the sock to create a sock bun. Loop the ponytail in such a way that the edges of the ponytail come out through both sides of the sock. Coil the edges into a twisted braid. Wrap the braids around the bun to secure it. Tame the flyaways using bobby pins and your braided sock bun is good to go! 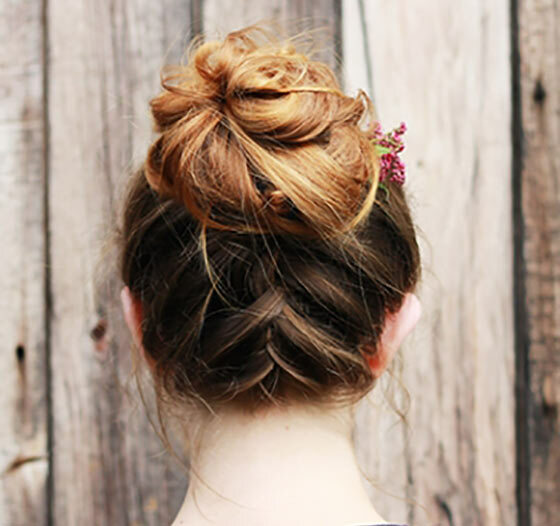 A braided bun with a twist. As I have always said, accessorizing always adds fun to any hairdo. 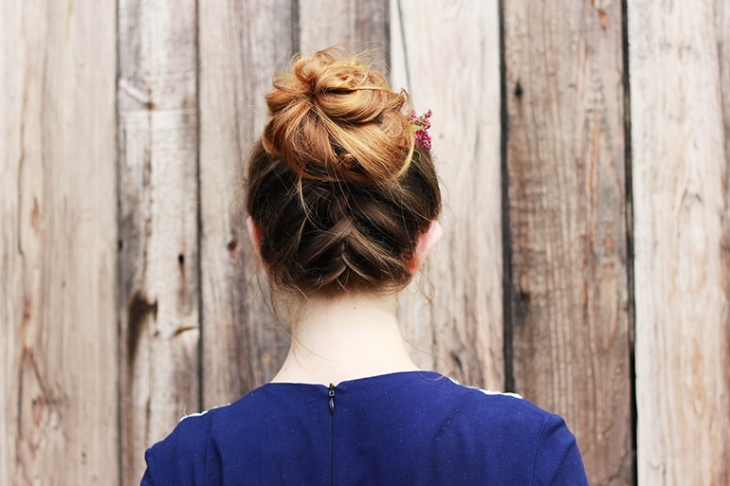 This braided bun is a chirpy hairdo to go for. Pair it up with some nice funky colorful outfit and you can so rock the day! Take the bangs and tease them for that extra volume. Tie the rest of your hair into a high pony at the back of your head. Braid each half into a regular three-section braid. Secure the ends of the braid using small hair-ties. Wrap the braids around each other to get a bun. Now, use the decorative hair elastic with a bow to tie around the bun. Spritz on some light-hold hairspray to ensure the hairdo stays put. Bored of the classic bun or the French braid? Worry not, now you can mix both unconventionally to come with an edgy new hairdo. This is chic, sophisticated and earns extra brownie points for being super manageable. Make a side partition and leave long bangs free. From the nape of your neck, start working an inverted French braid. When you reach the top of your head at the back, stop braiding and secure it with a hair elastic. Loop the loose end of the French braid halfway through the hair tie. 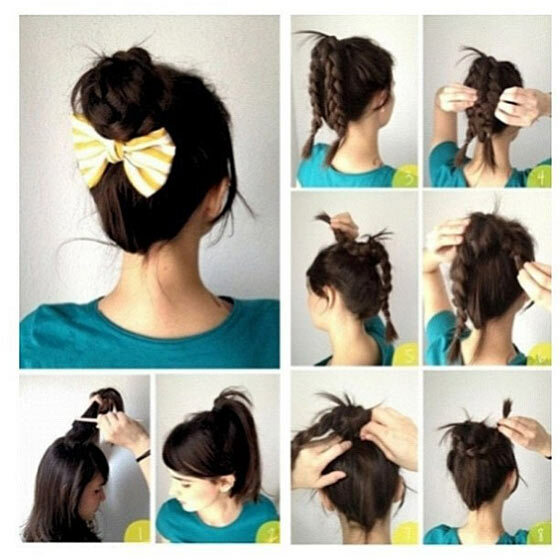 Wrap the loose ends around the hair tie to create a bun. Loosely wrap the bangs that you set aside, around the bun for additional volume. Another variant of the bun that fuses the beauty of the fishtail braid with it. This is easy to create and looks extremely effortless. It goes with any wardrobe staple. Tie your hair into a high ponytail at the back of the crown. Fashion your hair into a fishtail braid. Secure the ends of the braid with a hair-tie. Start coiling the braid around itself to create a bun. 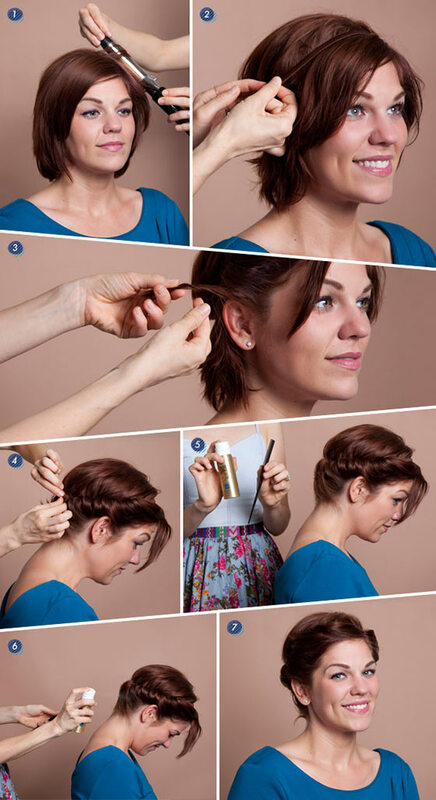 Secure the bun with U-pins so that the hairdo doesn’t come undone. Need something totally unconventional? Your search ends here. The faux hair updo is perfect for hair that is of shoulder-grazing length. Uber stylish and manageable, you should definitely give this one a try. Make a side partition and let a face-framing bang to fall onto your forehead. Place the elastic headband around the crown of your head. Start taking small sections of your hair around the headband and start looping them through the headband. Keep tucking the sections and secure with U-pins as you loop them to ensure they stay put. Finish styling by spritzing on some medium-hold hairspray. This is yet another extremely chic hairdo to sport for those with shoulder length hair. 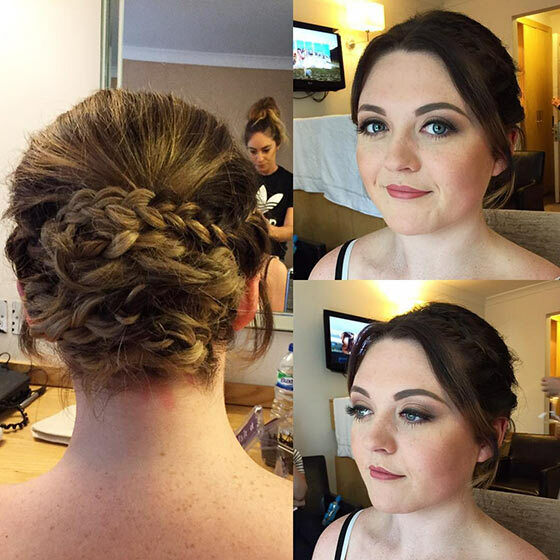 A unique updo which incorporates two side braids into a headband style. What more could a woman want? Trendy, upbeat, and hassle free, this hairdo calls for indulgence! Make a central partition and divide your hair into two parts. Braid each part into a rope braid. Secure the ends of the braid using hair elastics. Now bring the braids over the crown of your head and secure the ends onto the scalp using bobby pins. Once done, spritz some hairspray onto the hairdo to make it stay. Bold is beautiful! This hairdo is loud and powerful and gives off an aura of confidence to the wearer. Try it on with any high street staple and traffic-stopping looks guaranteed. With the paddle brush, brush all your hair to even it out. Gather your hair at the top of the crown and tie it into a ponytail with a hair elastic. With the teasing comb, tease your ponytail for extra volume. Now braid your ponytail into a loose Dutch braid. Secure the end of the braid using a hair-tie. Wrap the braid around itself at the base of the ponytail to get a bun. Once done, finish styling with a light-hold hairspray. Braids are fun, and so are buns. This inverted braided bun is the perfect offbeat hairdo for the modern woman. This hairdo is hassle free and easy to pull off. The inverted braids give the hairdo an edge and you can always accessorize your hairdo to make it more fun! Flip and brush all your hair towards the front. Start working your hair into an inverted French braid, starting at the nape of your neck. Braid till you reach the back of your crown region. Secure the braid using a hair elastic. 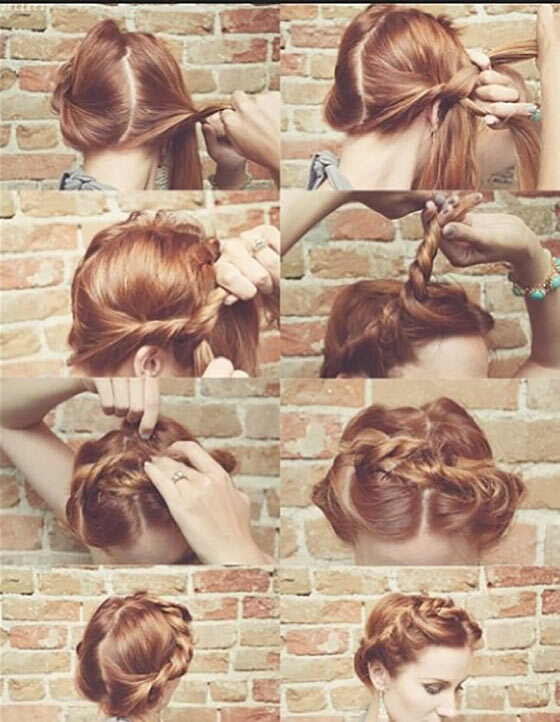 Start wrapping the braid around itself in order to create the bun. Keep securing the bun using U-pins as you go. Tuck the ends of the hair in using U-pins. Gently fan out the bun for a more casual look. Tame flyaways using bobby pins, if need be. Accessorize with a floral add on. Spritz on some light-hold hairspray to make the bun stay put. Simple and cute, this is one of the best updos for medium length hair that you can opt for during the scorching summer days. The braids overlapping above the bun adds to the whole casual summer appeal. Chic with an Indie vibe, this hairstyle is sure to set you apart from the rest of the crowd! Slightly tease the back of your crown hair for extra volume. Take two sections, one from each side of the head, just above the ears. Braid them into regular side braids. Now, wrap the rest of your hair into a messy bun at the nape of your neck. Now, take one braid over the bun and pin it down on the opposite side using bobby pins. Repeat the same with the second braid. The two braids should overlap each other. Gently tousle the hair on the top of your head for a casual effect. A very offbeat and charming hairdo to sport for those with medium hair. 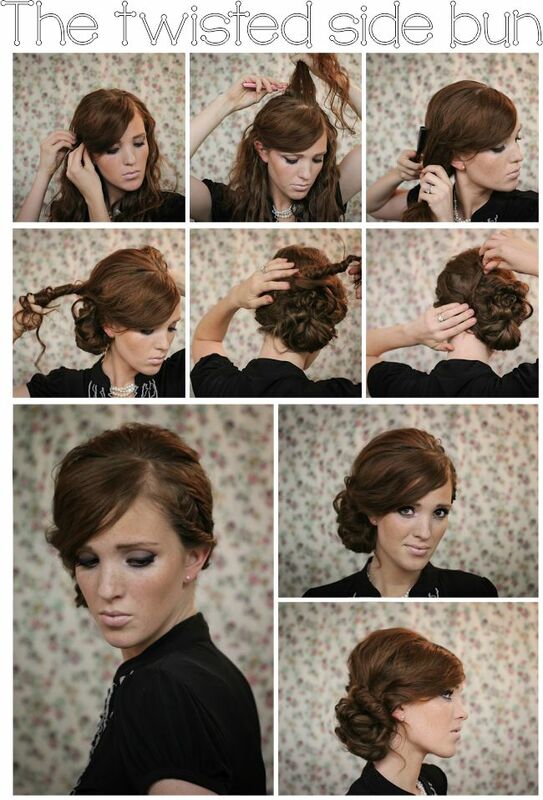 This hair updo is definitely going to set you apart in terms of style. 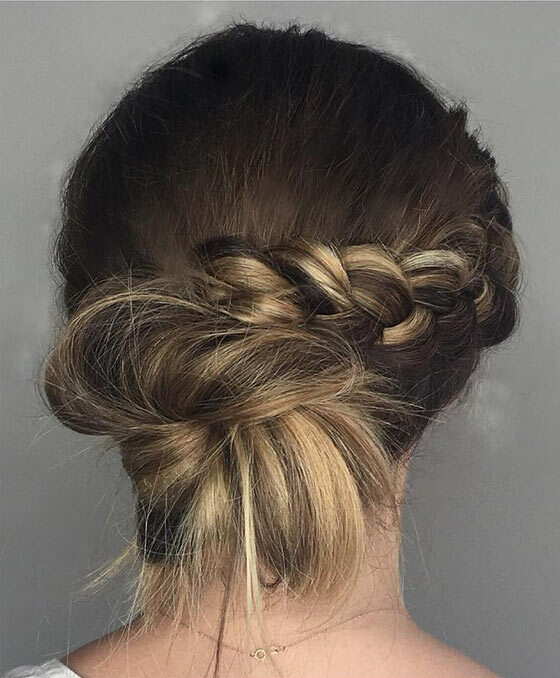 The swirling French braid ending in a high bun is easy to create and pull off. Make a deep side partition. 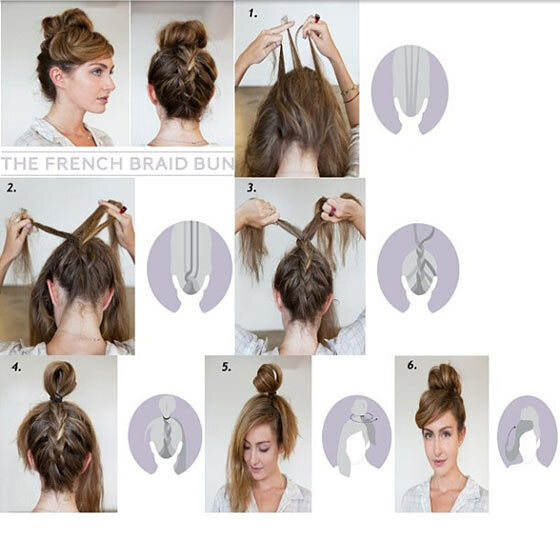 On the larger side of the partition, start working your hair into a swirling French braid. Braid your hair till you reach the back of your crown. 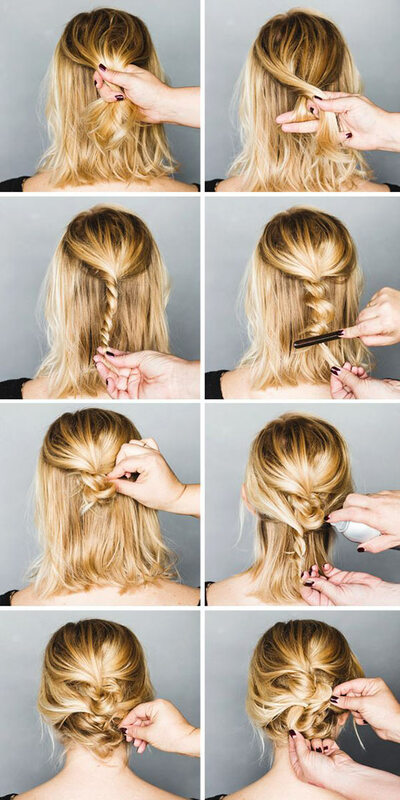 Secure the braid with a small hair-tie. Gather the rest of your hair, and along with the ends of the braid, tie it into a high ponytail. 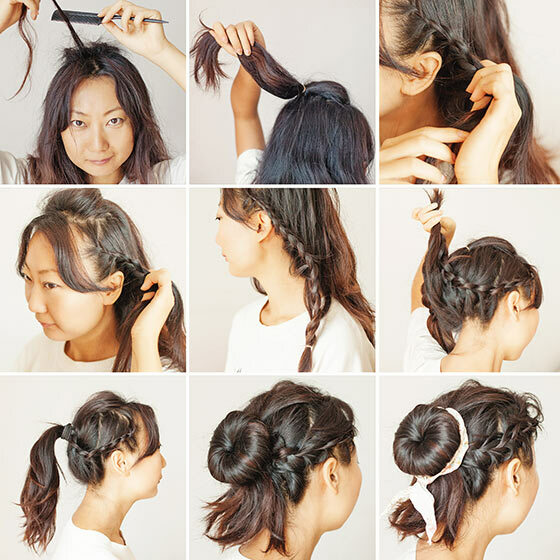 Wrap the ponytail around itself to create a messy bun. An elaborate yet trendy hairdo for those with medium hair. 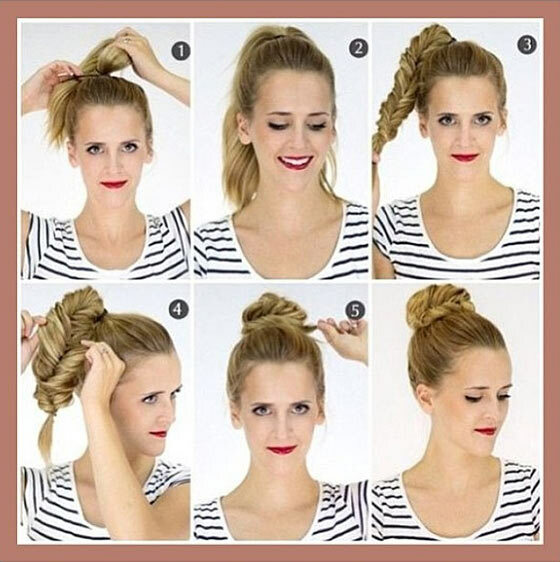 This pouf bun hairdo is guaranteed to give oomph to your personality. 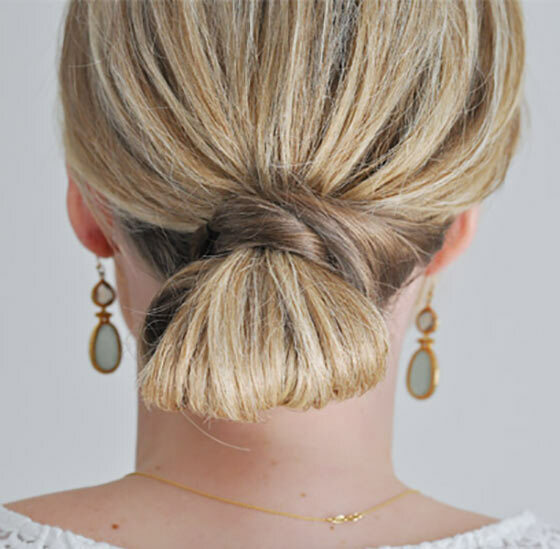 Delicate, yet stylish, this hairdo can be easily teamed up with any closet essential. Tie your hair into a neat ponytail at the back of your head. Place the volumizer at the base of the ponytail and cover it with the hair from the ponytail. Secure it in place with some U-pins and a hair elastic. Divide the edges of the pony below the volumizer into two sections. Now braid each section into a thin three section braid. Wrap the braids around the bun and tuck them in using U-pins. Voila! Your pouf bun is ready to rock! Apt for high street fashion, this hairdo can make you get the looks straight out of a runway show. Chic and simple, this hairdo has the potential to become your next best friend. The chain braid imparts an edgy appeal to the hairdo, while the low bun makes the hairstyle hassle-free. Separate side sections on both sides of your head. This section has to start at the beginning of your hairline. Start working these side sections into chain braids. For creating a chain braid, divide the section into two equal parts and tie them in into a simple knot. 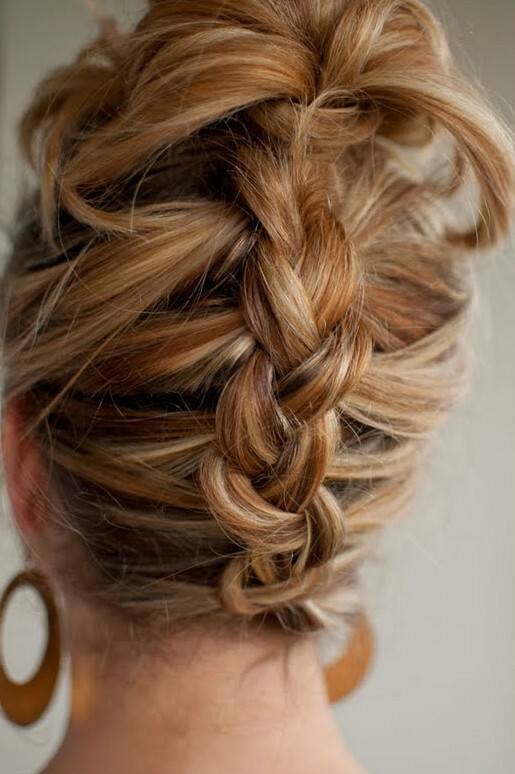 Add a thin strand from either side of the knot to the strand of the braid, like you would do for a French braid. Tie the sections into a knot again. Keeping adding strands and knotting the sections till you reach the nape of the neck. Repeat the same on the other side of the partition. Secure the chain braid to the scalp using bobby pins. Coil the pony to form a casual low bun. Bring some life to the boring braids by teaming up with an updo. 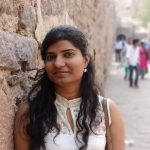 The inverted braid hairdo aims to do just that, to bring the best of bun and braid to you! Flip all your hair to the front and brush it. 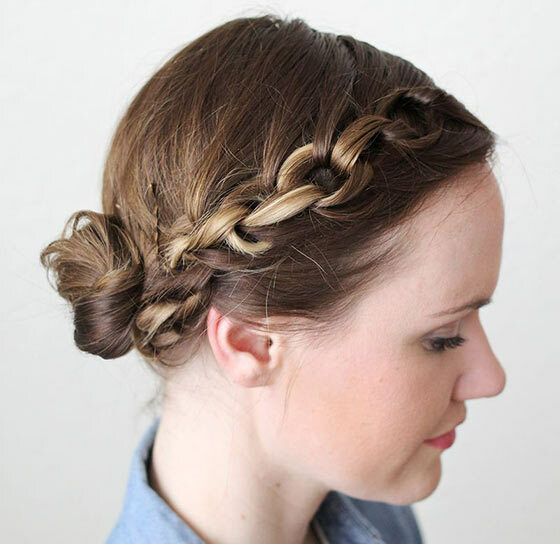 Start working your hair into a Dutch braid, starting at the nape. Keep braiding till you reach halfway down the length of your tresses. Once you’ve braided half of the hair, tie the braid upwards to form the updo. Secure the braid onto the scalp using U-pins. Finish styling by spritzing on some hairspray onto the hairdo. Demure and classy, this casual hair updo adds a touch of delicate femininity to your look. Perfect for occasions like weddings and receptions, you must give this hairdo a try. With the fine comb, thoroughly brush your hair down. Curl the lower half of your tresses. Use bobby pins just above your ears to keep all your hair in place. 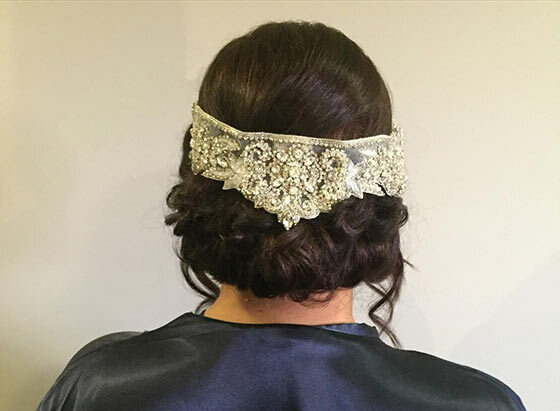 Place the lace headband on top of the upturned curled sections. Secure the headband with bobby pins. Finish the hairdo by spritzing on some strong-hold hairspray. Chic and sophisticated defines this hairdo. 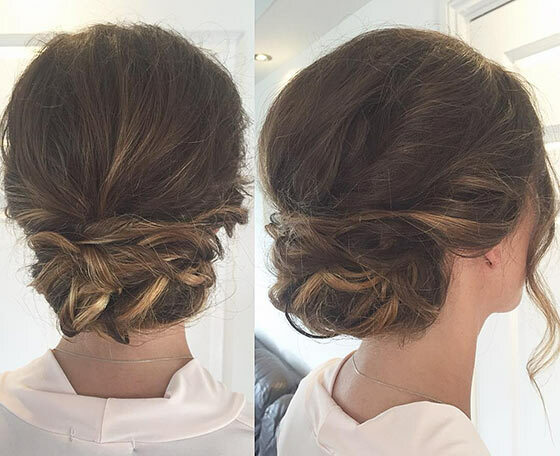 This stylish hair updo takes us to the minimalistic high street fashion, and we love it! 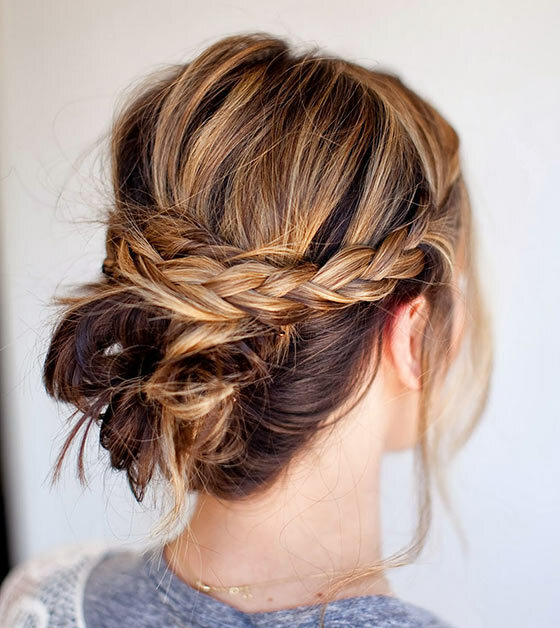 This hairstyle is very simple and easy to pull off! Gather all your hair at the base of your head. Take out a section of hair from one side. Gather the rest of your hair and tie it into a ponytail. Then, loop half of the ponytail through another twist of the hair elastic for a looped ponytail. Now, take the side section kept aside earlier and wrap it around the looped ponytail. Secure this neatly with U-pins. Spray on a little light-hold hairspray to make the hairdo stay. Hep and a little unkempt, this hairdo is perfect for a casual day out. This is a no-fuss hairdo that is bound to bring out the carefree side of your persona. Very easy to create and pull off, this effortless hairdo is gonna stick with you for a while! Pull your hair into a ponytail on the top of your head. 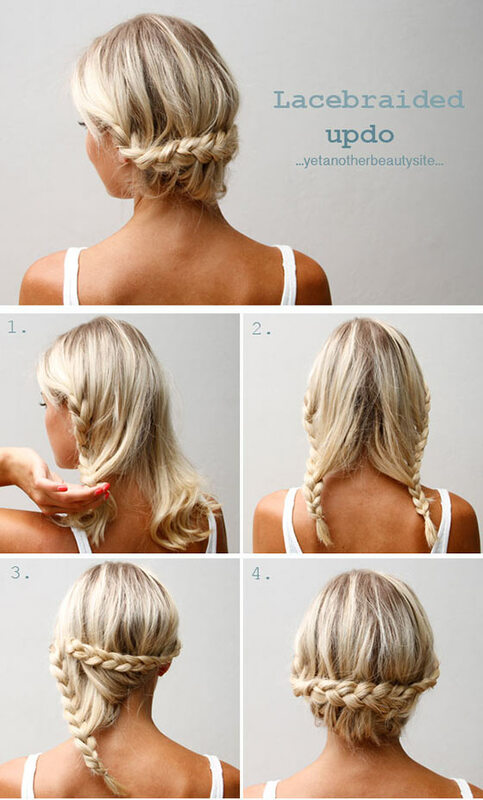 Braid your ponytail into a regular three section braid. Secure the end of the braid using a hair elastic. Once done, twist the braid to form a figure of eight over the base of the ponytail. Secure the knot using U-pins. Don’t tuck in the loose ends of the braid into the bun. Spritz on some strong-hold hairspray. Effortlessly graceful and easy to sport, the casual twisted low bun is a fun way to style your locks this season. Be it a day out with your friends or a lunch date, this hairdo fits well for almost all the occasions. Use the teasing comb to tease the crown for extra volume. Even out the hair a bit and gather the hair at the base of the head. Leave thin sections from just above the ears out on both the sides. Loosely braid the remainder of your hair. Once you’ve reached the edge of the hair, secure the braid with a hair elastic. 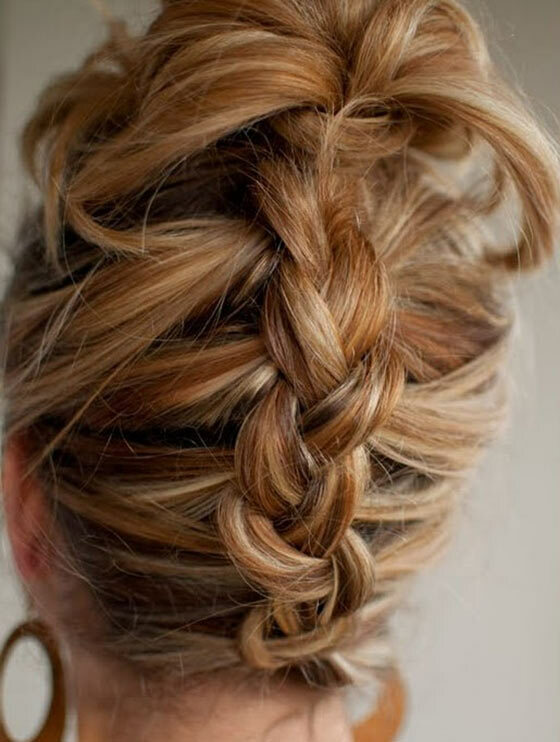 Twist the braid to the base of your head, the knot’s appearance should loosely resemble that of a chignon. Secure the knot with U-pins. Now coming to the side sections, twist them and wrap them around the knot. Tuck the edges of the twisted side sections in using bobby pins. Another graceful member of the chignon family, the simple coiled bun is the epitome of simplicity and charm when it comes to styling your hair. 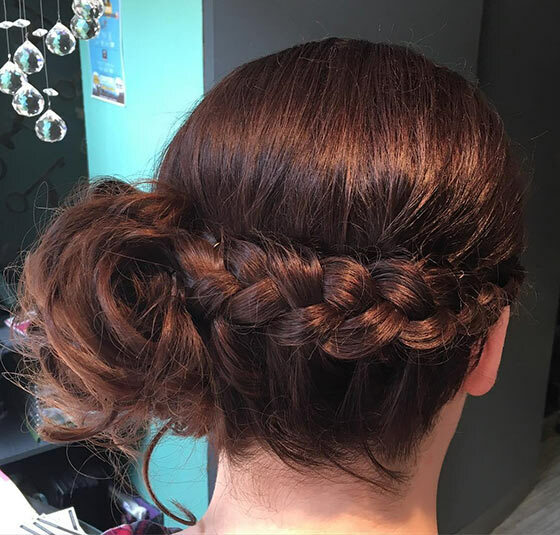 Easy to create and carry, this hairdo is perfect for casual occasions. Take out face-framing sections from each side. Secure the hair in place with the help of bobby pins right above your ears. Curl the lower half of your hair. After curling, take sections of curled hair and turn it upwards. This will form small loops at the base of your head. Pin these loops using bobby pins. Now coming to the side sections, twist them and wrap them over the low bun. Secure the ends of these sections using bobby pins. Spray on some strong-hold hairspray so that the hairdo will not come undone. Another low bun hairdo for the fashionista in you. This is a simple and elegant style to wear your hair. Hassle-free, this casually chic hairdo will give off an effortlessly graceful vibe. Tease the crown for extra volume. Take one section from each side of your hair, just above the ears. Tie the rest of your hair into a low bun, at the nape of your neck. Start working the side sections into side braids. Once done braiding, cross the side braids over the bun. Secure the ends of the braids using bobby pins. Finish styling by spritzing on some light-hold hairspray. Great news for all the ladies who want the punk look without chopping off their precious locks! Off-beat and punk inspired, this updo is for the bold and the beautiful. Sport this look to carve a niche for yourself! Tease the front of the crown to get extra volume for the pouf. Create a small pouf at the front and secure it with bobby pins. Gather all your hair at the nape of your neck. Separate a few thin sections from the mid-section of your hair. Start braiding the thin sections into regular micro-braids. At the nape of your neck, start braiding your hair into an inverted French braid. 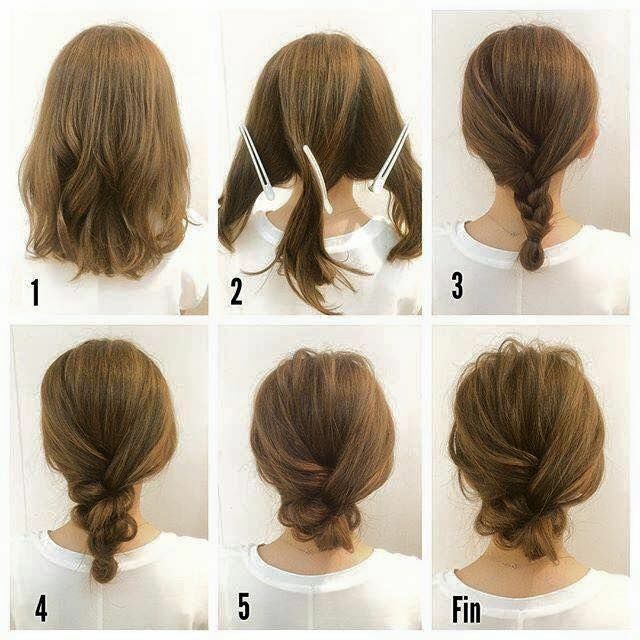 Braid all the way till you reach the pouf at front. With your fingers, loosen the braids till they are puffy. Tuck in the ends of the braid neatly using U-pins. Release the micro-braids from the sectioning clips and loosely loop them through the inverted French braid. Finish styling by using some strong-hold hairspray to make this offbeat hairdo stay kempt. Another fun combo of braids, bun, and bangs for all the lovely ladies out there. Feminine and gorgeous, this hairdo will set you apart in terms of style. This hair updo is the perfect mix of messy and manageable. Make a central partition and let your bangs fall onto the front. Keep aside two thin sections; one on each side of the head. Start working these side sections into side braids by incorporating tiny sections into the braids as you go about it. Then, gather the rest of your luscious locks at the nape of your neck. 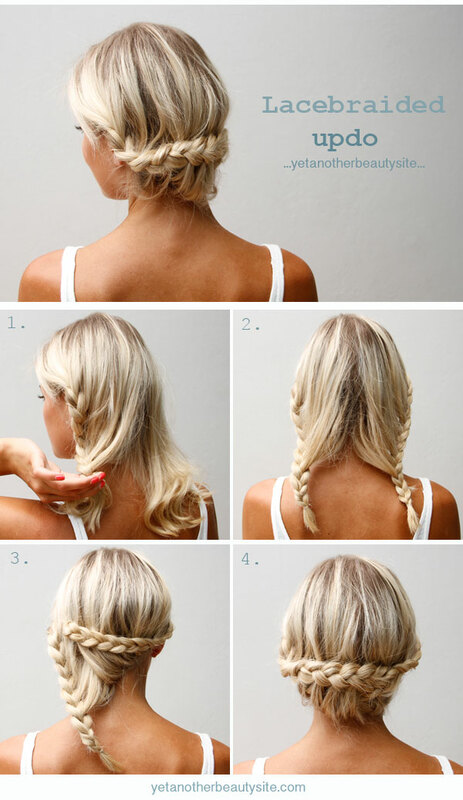 Start working your hair into a loose regular braid. Braid till you reach the edge of your hair and then secure it with a hair tie. Start coiling your braid into a loosely S-shaped bun at the base of your head. Secure this bun using an ample number of U-pins. Now, take the side braids and cross them over the bun from both sides. Finish styling by spritzing a little light-hold hairspray onto your hairdo. One more offbeat hairdo for medium length hair. Dutch is always a fun way to style your tresses, even more so if the outcome is as beautiful as this. Go ahead, try this on your hair and make all your girlfriends jealous! Start working your hair into a Dutch braid on one side, just above the level of your ear. Incorporate sections from both above and below in the braid. Keep braiding till you reach the other side of your hair. Now, take the loose ends of the braid and coil them around loosely to get a loose bun. Let the shorter loose ends fall freely for a tousled and unkempt effect. Tame flyaways with bobby pins. Spritz on some hairspray to complete the styling. Here comes another chignon to sweep you off your feet. One of my all time favorite medium length hairstyles, the chignon is classy and elegant. 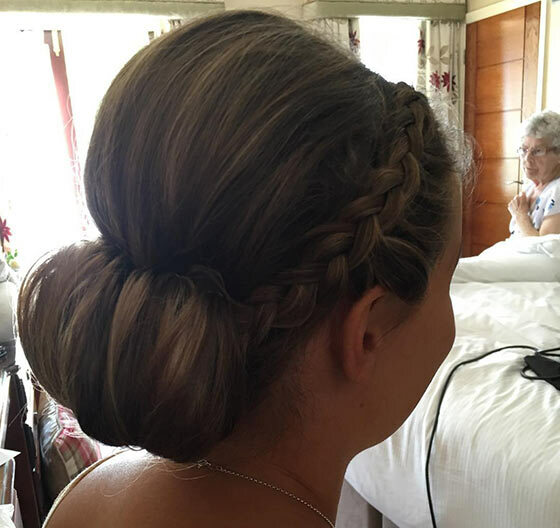 This variant of the chignon blends side braids into the hairdo. Sounds cool? Let’s check it out! Take out two side sections, one from each side. Start working the side sections into regular braids. Braid till you reach the nape of your neck. Secure the ends of the braid at the nape using bobby pins. Gather the rest of your hair and secure it with a hair-tie a couple of inches from the edge. Start rolling the hair upwards for the chignon. Once you reach the point where the side braids are pinned, roll the hair inwards and secure it with U-pins. Fan of the French twist but hair too thin? This is the perfect hairdo for you then. It’s easy to sport and easier to manage. This is also a very sophisticated hairdo which adds oomph to your personal style. Take the hair on the crown and tease the back of it for extra volume. Smoothen the outer side of the crown. Gather all the hair at the back of the head and tie it into a loose ponytail. Start twisting from one side to create the French twist. Once you’ve twisted it tight enough to your liking, secure it with U-pins. Finish the look by spritzing on a little light-hold hairspray. Someone has rightly said, less is more. So apt for this chic hairdo. A ponytail doubly twisted and looped gives an uber casual appearance and is perfect for high street styling. Gather all the hair at the nape of the neck. Tie it into a pony a couple of inches above the nape. Create a small gap at the base of the ponytail and pull the ponytail through the gap from above. Tighten the hair elastic and repeat the step one more time. Rearrange the twisted ponytail and secure with U-pins. Finish styling by spraying on a little light-hold hairspray onto the hairdo. All good things come to an end, and sadly, so has our list. If you liked these easy updos for medium hair, go give them a try and let us know which one you’re going to stick to in the comments section below!